Tatyana Ryzhkova was born in 1986 in Minsk, the capital of Belarus. At the age of 10, she took her first guitar lessons from the best music teacher of Belarus, V.V.Gromov. Thanks to her talent, perseverance and the guidance of her teacher, she was able to achieve a high proficiency level, which allowed her to perform successfully at an international duets competition in Poland. As the youngest competitor, Tatyana got the highest mark in her group and was given an honorary diploma. In the following 2,5 years Tatyana took part in more than 200 concerts on some of the most significant stages of Minsk and Belarus, such as the Big Hall of The National Philharmonic, Theatre of Musical Comedy, the Church of St. Roch, and also at some governmental and presidential concerts. In 1999 Tatyana Ryzhkova was given the scholarship of the Presidential foundation in support of young talents. Various radio and TV performances helped her win love and success of the public. Tatyana started her higher education under the guidance of the wonderful teacher Michael Zhuravlev at the Glinka Music College in Minsk. After only a year she successfully passed all the necessary exams and was accepted in the Liszt Academy of Music Weimar, Germany (Hochschule für Musik Franz Liszt Weimar) into one of the most prestigious guitar classes by the famous professor of guitar Thomas Müller-Pering. In 2009 Tatyana Ryzhkova became the scholarship holder of the New Liszt Foundation (Neue Liszt Stiftung Weimar). Prize-winner of various competitions in Belarus, Russia, Poland and other countries, participant at international festivals in Poland, Germany, Italy, Tatyana took master-classes by the leading guitarists of Europe, such as Carlo Marchione, Pavel Steidl, John Dearman (LAGQ), Olaf van Gonnissen, Giampaolo Bandini, Darko Petrinjak; Tomasz Zawierucha, Kurt Rodarmer among others. 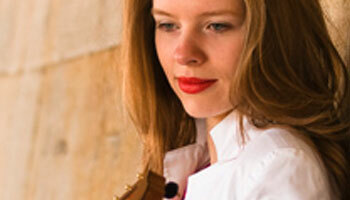 At present she actively continues her stage career and leads guitar classes at music schools in Achim and Bremen. Tatyana’s recordings attracted more than 2 000 000 visitors on the Internet and the tendency is growing. Tatyana’s performance is noted for a special fullness and softness of sound, delicate and sensual musicality, elegance of style, virtuosity and reach repertoire.Tatyana has another talent: she writes her own songs. They combine meaningful content, accessibility, emotional warmth and theatrical expressiveness.